The rulesets in the PegaDM application have been moved to the PegaRULES application. This change makes the decision management functionality available for Pega 7 Platform users by default, without any additional configuration. The DSM rules, landing pages, API, and function libraries are now part of every application that you build on the PegaRULES application. Existing applications that were built on the PegaDM application record remain functional. Groupings for Decisioning landing pages and Decision rule types that are available in the PegaRULES application. Pega-DecisionArchitect - Provides the user interface, data model, and forms. 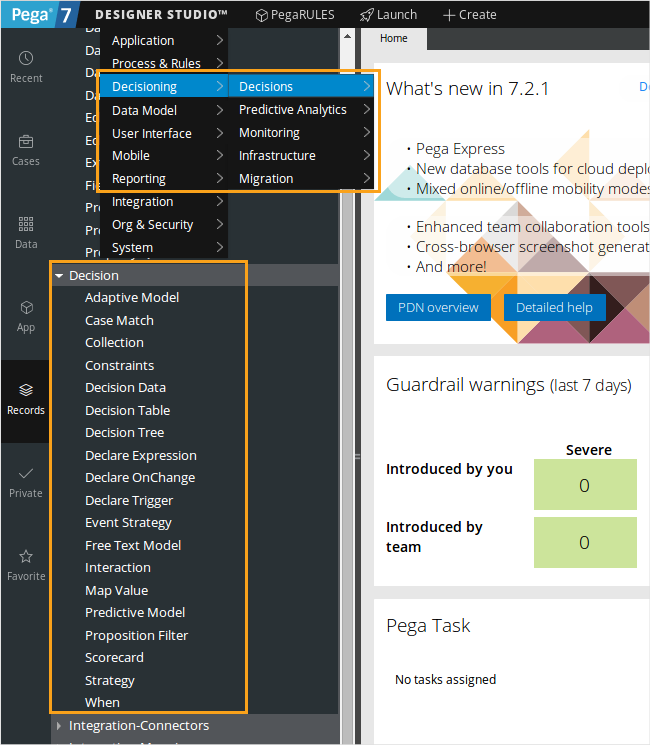 Pega-DecisionEngine - Provides the execution data model and run-time implementations that support Decision Management rule types and landing pages. Pega-BigData - Provides the Cassandra and HBase connectors and the Hadoop record configuration. Pega-NLP - Provides the Text Analytics landing page, the Free Text Model rule, and the Facebook, Twitter, and YouTube data sets. PredictiveAnalytics-UI - Renamed to Pega-PredictiveAnalytics. Part of the PegaDM application record, it provides the Predictive Analytics Director portal implementation. PredictiveAnalytics-IntSvcs - Renamed to Pega-PredictiveAnalytics-IntSvcs. Part of the PegaDM application record, it provides the Predictive Analytics Director run-time implementation. Pega-DecisionManager - Part of the PegaDM application record, it provides the Decision Manager portal implementation and supporting administration functionality (revision management, privileges, and default roles). Pega-DecisionBC - Part of the PegaBC application record. To access the full spectrum of decision management functionality, add Predictive Analytics Director (PAD) and Decision Manager portals in the access group of your Operator ID. The Predictive Analytics Director and Decision Manager portals are part of the rulesets that are included in the PegaDM application record. 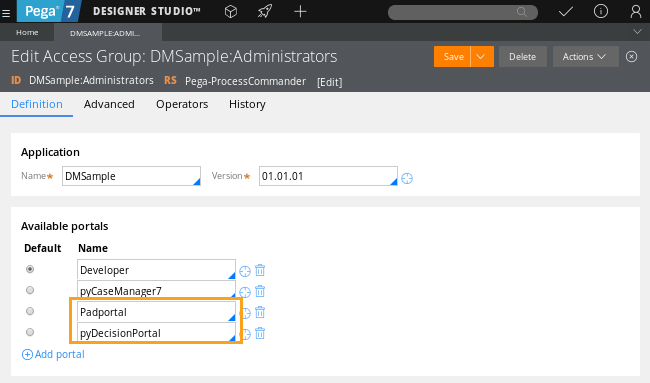 To access these portals, you need to build your application on PegaDM, or include PredictiveAnalytics-UI, PredictiveAnalytics-IntSvcs, and Pega-DecisionManager rulesets in your application. Padportal - Provides access to the Predictive Analytics Director (PAD) portal. pyDecisionPortal - Provides access to the Decision Manager portal.